The search for great-tasting, all natural dog chews is over! 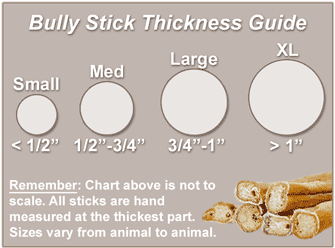 Our 7" Straight Bully Sticks feature a large thickness that's safe enough for dogs of all sizes to chew. If you've got your hands full with a pup who just can't seem to stop chewing on everything in sight, this might just be your dog's new favorite treat. Made of 100 percent natural and delicious beef muscle. Only the best to keep your pups comin' back for more. Q. Are your Bully Sticks natural? A. They sure are! Because your dog's health is our top priority, our Bully Sticks are free of any artificial ingredients such as hormones, additives and other weird chemicals you can't even correctly pronounce. They only contain a single ingredient: the most delicious, natural beef muscle found on the planet. These truly are dog treats the way they should be! Q. Are your Bully Sticks healthy? A. Yes, they are! Our Bully Sticks aren't just delicious (but that's a huge plus, too). They offer your pup a number of health benefits, including improved doggie dental health and reduced stress and anxiety levels. Combine that with the fact that our bully sticks are completely all natural and you've got yourself an amazingly healthy dog chew. Q. How many Bully Sticks can I give to my dog? Q. Do your Bully Sticks smell? Q. How long is a Bully Stick's chew time? A. Identifying how long lasting a chew will be is a difficult task, as it varies greatly between each dog's chew style and each owner's definition of a long chew time. For example, while 3 hours may be a short chew time for some customers, it can be considered a long chew time for others. If your unsure of which bully stick will result in the desired longevity, we recommend starting out with one of our Bully Stick Variety Packs! The variety packs, which come in three sizes, will allow you test out different types of bully sticks and help you find the one that is best suited for your pup. A. You heard correctly! Large quantities of our Bully Sticks are available for a discount--in fact, you can save up to 15% on your order! We also offer an Auto Delivery feature that certainly comes in handy--simply tell us how often you'd like us to deliver your supply of yummy bully sticks and we'll be sure to get 'em to you on time. 7" x 0.875" x 0.875"
We always recommend supervision while feeding your pet any treat or chew. Remove any large, swallowable pieces to prevent blockages. Provide plenty of drinking water to help with digestion. Feel free to contact us with any questions.